First add the videos you need to convert from the “Download” and "Record" tab to the "Convert" tab. Or you can simply drag and drop your local videos to the "Convert" tab. Now click on the “Convert” button to open the window to choose the output format. Here click on the “Apple Software” tab and select iMovie, iDVD, or Final Cut Pro. Lastly, click on the “OK” button to start the conversion. 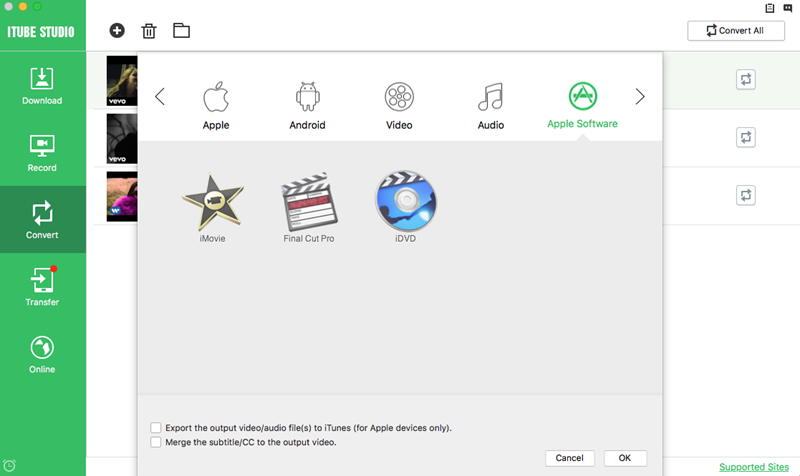 After that, you can import the video to iMovie, iDVD, or Final Cut Pro for editing.